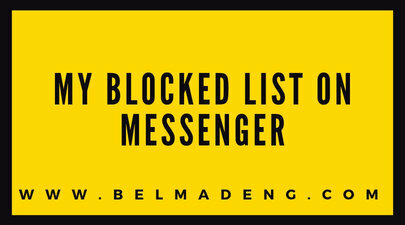 My Blocked list on Messenger: Just like Facebook, you can also block and unblock people on Messenger. You can block messages from someone on Messenger if he/she has been sending you spammy stuff or irrelevant messages that do make you feel uncomfortable. 1. The person you block will no longer be able to contact you (example: send you messages, call you) in Messenger or in Facebook chat. 2. You'll also no longer be able to contact them in Messenger or in Facebook chat. From the above-listed points, you'll agree with me that blocking on Messenger just like Facebook blocking is also a two-way thing. That is to say that when you block someone from your "friends list" on Messenger, you're in turn block from the person's list. So before you proceed with blocking someone on Messenger or Facebook, you need to be sure that you need less or nothing from the person. 1. From Home, tap your profile picture in the top left corner. 2. Tap People and then tap Blocked. 3. Tap the name of the person you want to unblock. 4. Tap next to Block Messages to unblock them. 1. Form Home, tap your profile picture in the top right corner. 2. Scroll down and tap People. 4. Tap Unblock next to the name of the person you want to unblock. Note that when you block messages from someone on Messenger, it doesn't automatically block them on Facebook.